"Sampath Speaking" - the thoughts of an Insurer from Thiruvallikkeni: Granddad, the oldest lungfish euthanised !! Granddad, the oldest lungfish euthanised !! Are you attracted to ‘fish’ as pets ? – have you raised aquarium at home ?? – it is stated that smaller fish have shorter lives. Some have less than a year ! While in their natural environs, they are at the mercy of bigger fishes and other predators including humans, most domestic fish too, do not live as long as they could. Improper care and poor environment usually lead to early death in many species. Although goldfish can live 20 years or longer, many fail to last a single year. Of the many species, have you ever heard of ‘lungfish’ that live only in Africa, South America and Australia. An aquarium can range from a small glass bowl to immense public aquaria that house entire ecosystems such as kelp forests. It generally has at least one transparent side in which water-dwelling plants or animals are kept and displayed. The term, coined by English naturalist Philip Henry Gosse, combines the Latin root aqua, meaning water, with the suffix -arium, meaning "a place for relating to". For many of us, it is so enchanting to keep looking at fish swimming whether in a pond or in an aquarium. Fish keeping is a popular hobby which sure would give you lot of mental peace and tranquility. There are very big aquariums in some Countries where humans walk inside and from the sides can view the marine animals in their natural best. For someone used to enjoying the sight of guppies bred at KairaviniPushkarini by Madras Corporation – there was another one at Marina. Lot has changed on the sandy shores of ‘Marina beach’ known for its pristine beautiful sandy shores - the ‘radio beach’ no longer exists – behind the Kannagi statue stood ‘Seerani Arangam’- the Thilaga Thidal place on which so many meetings were held. Of the many missing is the free water booth maintained by Rajasthani Youth Association, the Mail van that used to collect letters at Marina in the evenings till 06.30 pm, Public library ……………..and….. the aquarium ~not a big one, rather small one – having some 30 odd water tanks and not many exotic fish – have seen star fish, star tortoise and seahorses among other things here. Miles away in Chicago, Illinois in US is the Shedd Aquarium that opened on May 30, 1930. The aquarium contains 32,000 animals touted to be one of the largest indoor aquariums in the world with 5,000,000 US gallons of water. Shedd Aquarium was the first inland aquarium with a permanent saltwater fish collection. It is in news ~ albeit for a different reason. The longest-living fish in a zoological setting, a lungfish known as Granddad acquired by the Shedd Aquarium in Chicago in 1933, has been euthanised after suffering failing health well in his mid-90s !Lungfish, which are native to the Mary and Burnett rivers in Queensland, Australia, have a single primitive lung and are among the few fish that can breathe air. Granddad, who came to Shedd from Australia in anticipation of the 1933-34 Chicago World’s Fair, was seen by more than 104 million people during his time in Chicago, aquarium president Bridget Coughlin said in a statement on Monday announcing his death.“For a fish who spent much of his time imitating a fallen log, he sparked curiosity, excitement and wonder among guests of all ages who would hear his story and learn about the incredible biology that makes his species a living fossil and one of the oldest living vertebrate genera on the planet,” Coughlin said. 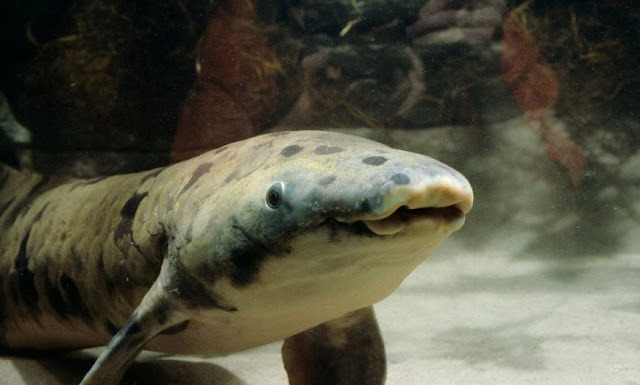 According to the aquarium, lungfish, which can live to be more than 100 years old and are a protected species in Australia, have existed for nearly 400m years and fossils show they have remained unchanged for over 100m years.A Shedd spokeswoman said Granddad’s exact age was unknown but that he was believed to be in his mid-90s. The aquarium said Granddad was euthanised after losing interest in food and showing signs of organ failure. The secret to his long life is reported to be - his "pretty relaxed life... imitating a fallen log" at the bottom of his tank, according to a blog postby his caretaker.He was also treated to a balanced diet of "fish, shrimp, clam, a prepared gel diet and a mix of fruits and vegetables," including a daily helping of Romaine lettuce and a weekly treat of earthworms.Granddad was not only Shedd’s longest-lived resident but also the oldest fish in any public zoo or aquarium in the world. The aquarium was started with Shedd’s initial donation of $2 million – but John G. Shedd never saw his aquarium. He died in October 1926 at age 76. The board of directors carried on, and ground was broken in November 1927. The John G. Shedd Aquarium opened to throngs of guests on May 30, 1930. Dogs are most insured pets and not Cats ... ! !